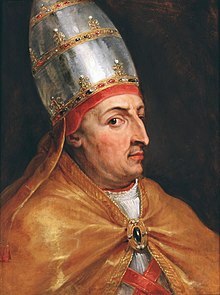 Pape Nicholas V (Laitin: Nicholaus V) (15 November 1397 – 24 Mairch 1455), born Tommaso Parentucelli, wis Pape frae 6 Mairch 1447 till his daith in 1455. ↑ Filelfo & Robin (2009), p. 370. This page wis last eeditit on 5 Apryle 2017, at 17:24.